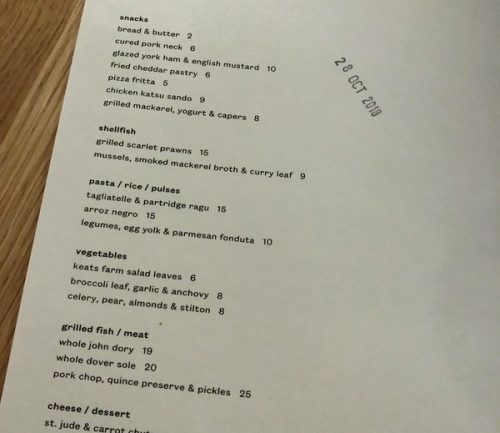 It’s Sunday night, and I head out to London Fields for dinner at Bright, a rising star on the London gastro scene. It’s located on the site that used to house Ellory (now morphed into the excellent Leroy in a new location), and it is from the folk behind P Franco and Noble Fine Liquor. And Bright on a Sunday night is bustling. Full up. Good vibe. Here’s my review. The dining room is clean, contemporary and nicely informal. It’s pretty crowded, and neighbours are close as, but it’s not a problem. We eat and drink well. The menu is short and perfectly formed. First, some wine. The wine list is quite brilliant. It’s natural-heavy, but perhaps best described as lo fi, with a lovely selection of authentic wines, not just the same old natural names. [This is perhaps the only hitch of the night: the staff don’t seem to know the wine list perhaps as well as they should.] 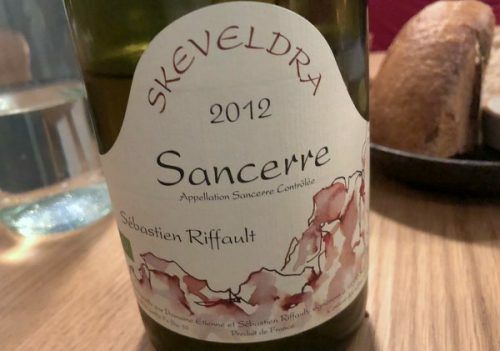 We order the Sébastien Riffault Skeveldra 2012. Skeveldra is an old-vine plot that has lots of flint and silex, and it’s 0.7 hectares in size. Sebastien Riffault has a Lithuanian wife, and uses Lithuanian names for each of his plots. He makes wines without adding any sulfur dioxide, and this wine is gorgeously complex in 2012, with rich flavours of spice, peach and minerals, as well as some citrus. (£72 well spent.) It’s not obviously Sancerre, but there’s terroir influence here in which the limestone and flint affect the mouthfeel, I reckon. 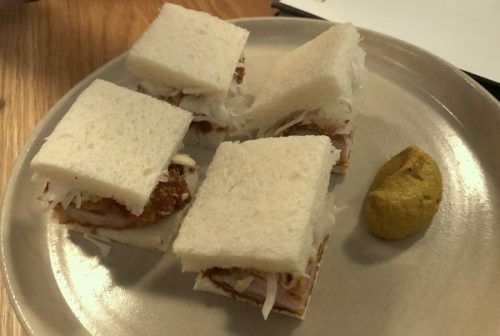 This is a perfect match for one of Bright’s signature dishes, the chicken katsu sando. It’s one of the most delicious dishes I’ve eaten in a while. You have to respect a restaurant that can put something like this on the menu! It is worth visiting Bright and ordering three or four portions of this, alone. 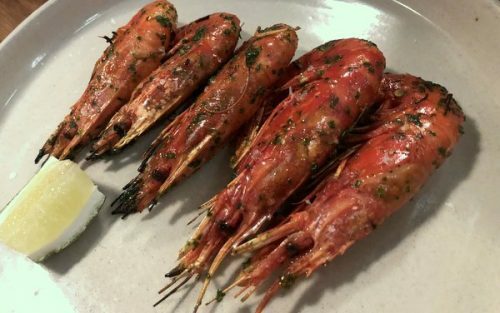 The grilled scarlet prawns can’t claim to be as innovative, but they don’t need to be, because they are perfectly done. Another hit: the celery, pear, almonds and stilton (not pictured). 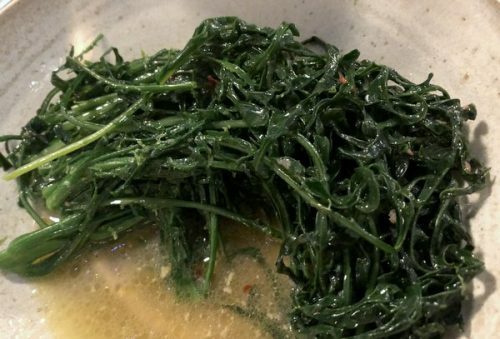 Broccoli leaf, garlic and anchovy (above) is another dish that isn’t just about novelty, but flavours beautifully combined in a happy synergy. 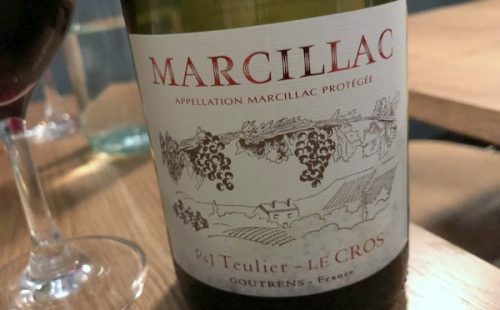 Time for a second bottle of wine, and it’s an old friend in a new vintage: the 2016 Marcillac from Domaine du Cros. This is a fabulously pure, smashable red with more than a hint of blood/iron/iodine seriousness. It is very well priced at £28 (this is one of the best value wines on the planet). We finished our meal with the fig desert, which – once again – was a hit. A thoroughly satisfying experience. Not cheap, but then most of our bill is the wine. 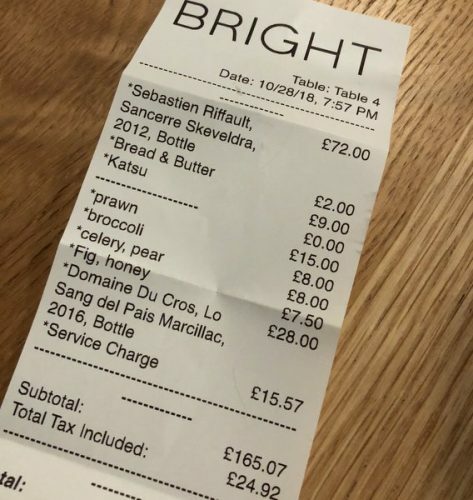 [It’s the London story: the food is too cheap, the wine marked up too much because that’s the only way restaurants can make some margin.] Bright deserves all the positive press and glowing reviews that it’s getting.